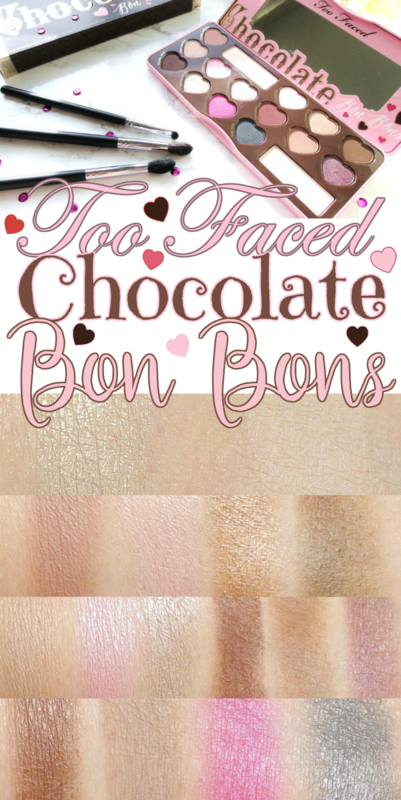 In the tradition of the slackereeist slackers who ever slacked, I am just now getting around to sharing with you the Too Faced Chocolate Bon Bons Eye Shadow Palette that I bought... A long, long time ago. Because I'm a baller, that way. 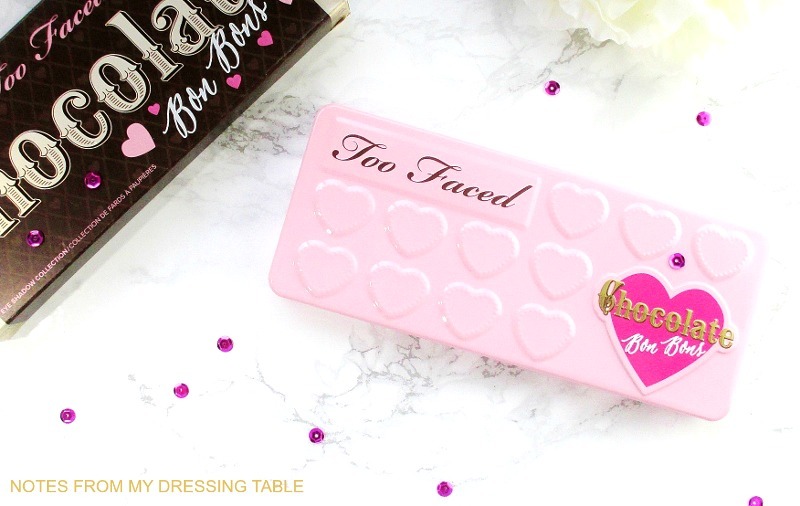 Contained within this pretty pink, heart embossed tin is a collection of sixteen deliciously cocoa scented eye shadows and a good sized, pink trimmed mirror that can be useful for on the go getting ready. The overall feel of this palette is neutral with pops of pretty, wearable colour. There is a mix of matte, shimmer and metallic finishes all of which combine to let me create as many beautiful eye looks as my little heart could desire. A quick close up of the goods. Aren't these colours pretty? I adore palettes like this because they feed my need for neutrals yet they offer pretty splashes of the colour a part of me craves, from time to time. Satin Sheets is a softly golden shimmer infused ivory. Divinity is a satin matte ivory. Both of these shadows are smooth and glowingly pretty and they work as beautifully as face highlighters as they do on my eyes. Almond Truffle is a softly satin cocoa rose. Sprinkles is a strawberry pink satin. Molasses Chip is a warm, bronze-y gold shimmer. Malted is a greyed brown matte with tiny gold sparkles that don't really stick around when blended onto the eye. This shadow is a touch stiff and needs a little building for full payoff. Cashew Chew is a gentle, satin tan. Cotton Candy is a sweet, pastel pink shimmer. Cafe Au Lait, a taupe shimmer. Bordeaux is a deep burgundy matte. This one is stiff and recalcatrint. It will work but I have to fight with it. Mocha is a coffee with cream brown matte that is not super pigmented. I like it for transitioning up onto my orbital bone but it needs extra blending to smooth it. Black Current is a not terribly pigmented grape purple with a lighter purple shift and tiny gold and purple sparkles. I know that this shadow disappoints a lot of people but I rather like it. I rarely wear purple on my eyes but when I do, I prefer a more low key approach to the shade. Dark Truffle is a dark chocolate brown that is a little stiff and a touch patchy but has pretty good pigmentation and will perform with a little care. Pecan Praline is that perfect transition type shade. Totally Fetch is a bright, fuchsia pink satin. Earl Grey is a beautifully greyed teal shimmer. Overall, I am pleased with this palette and how it performs. All of the colours appeal to me and with a few exceptions, the shadows are soft, smooth, nicely pigmented and apply, build and blend effortlessly. A few are a little stiffer, can be patchy and need some coaxing to get their act together and one, Black Currant lacks real pigmentation. 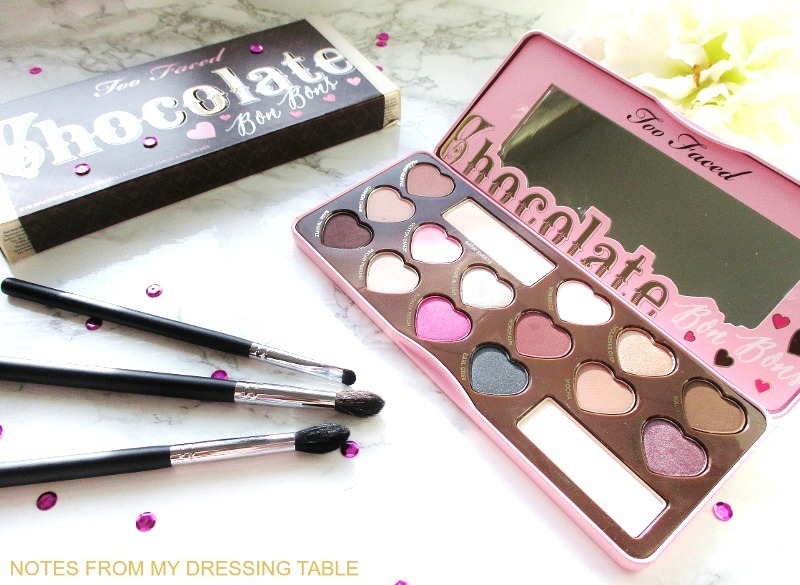 I am happy that I bought the Too Faced Chocolate Bon Bons Eye Shadow Palette and if you are like me and love a good neutral palette with soft pops of pretty colour, I heartily recommend that you check this beauty out. You can buy this palette at Sephora, Ulta Beauty, Macy's and Too Faced Website. Not everyone is as crazy as we are and have to have things instantly. A late review for a current product is great. I see several shades here that I'd really love to wear (and some that probably wouldn't work for me either). I find the "late" review refreshing! I was just considering this palette because it's the only one of which chocolates I don't have. Now I know I do need it! Super cute packaging on the palette! I love mine but haven't used it for a full look yt! So glad I eventually bought it! I skipped this one and now you're making me regret it, damn you Erika!! It's my favorite of the 3 chocolate bars because I think it's the most flattering on my skintone. Glad you picked it up! You naughty temptress! You knew that I was thinking about these! Now this! You know that I cannot resist the things that you review favorably! I like that there are those bright pops of Color among the neutrals! I don't mind seeing this 'late'. I wanted this palette so bad and then never bought it. Seeing it again makes me think I still need it.